Ten months ago, I was diagnosed with Guillain-Barre Syndrome. Today, while I am still dealing with some lingering effects, I can say I am a lot closer to being 100% recovered than at any time since the diagnosis. Still, I’m not at 100%… probably 75%—which means I can do the basics around the house, but walking any distance is still not recommended, and doing physical things like yard maintenance or hanging Christmas lights, still a dream. The numbness I’ve fought since that first day, has pretty much gone away, except on days where I really overdo it. Every once in a while, my checks will still go numb. If I notice that when it starts, and rest for a while, the symptoms usually reverse and clear up within minutes, or at worst, hours. I can actually see the problem in the mirror—I’ll get blotchy-red patches on my cheeks where they’re numb. It’s kind of freaky. If I push beyond that, I’ll start to feel it in my fingertips. If I let it get that far, it’ll usually take a good night of sleep to recover. If I go beyond the tingling fingertips, it’ll start to affect my left leg. Once at that point, I’ll be down for a day or two. I don’t let it go any further than that. My eyes are still a work in progress. I continue to do vision therapy on a daily basis, trying to get my eye muscles to improve my object tracking, as well as my convergence and divergence. Those exercises involve tossing a ball from one hand to the other hand twenty times, first while moving my whole head, then only moving my eyes. 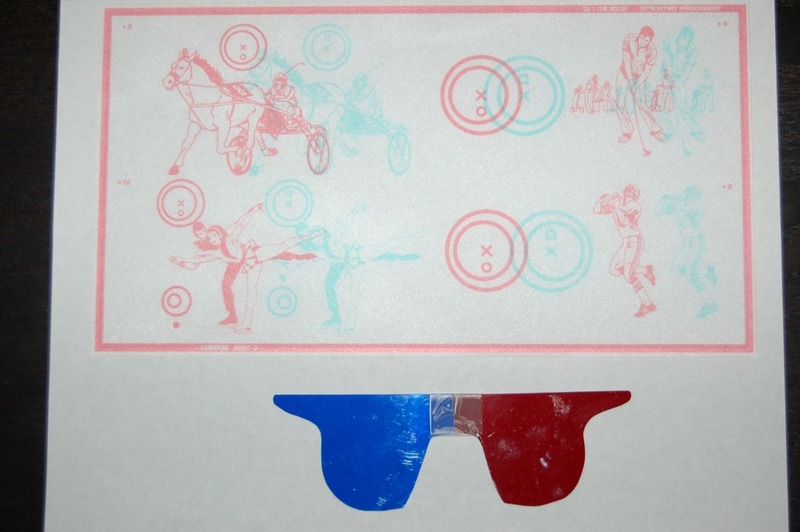 After that, I stare at a special piece of plastic (below) with really awesome ‘3-D’ glasses on, and try to get the colors to align. Normal people can apparently get these images to align in less than a second. The two images on the right take me a minute or two to do, and I’m still working on the ones on the left. But that is progress—when I started, I couldn’t even get the ones on the right to move. If I overdo it with my eyes, either by reading or working on the PC too much, it can take a couple of days to recover. They tire easily still, so I take frequent breaks, and space my work out through the day. The other issue I ran into this month is that I began to notice how atrophied my muscles have become due to inactivity. I resumed strengthening my shoulder muscles by working out with light weights, but that set my neck into a tizzy (perhaps because of bad form or just a muscle imbalance) and that caused massive migraine headaches which are no fun at all. I’m going to try going to physical therapy in December to find ways to strengthen my neck to avoid that side-effect in the future. I’ve also been dealing with broken big-toe, suffered in October. It just isn’t healing as fast as I want it to, and it often keeps me awake at night. Bad sleep means lower reserves the next day, which leads to more issues. I don’t think this recovery has much to do with the GBS, except that I probably broke the toe because I tripped while walking over uneven ground, and I know GBS has definitely affected my balance and muscle strength in my extremities. So as of now, I’m still at home, writing and looking to build my freelance writing and software development client list. If I can get my toe to heal, stop the migraines, and get consistent, good sleep at night, I should be able to make more progress in my GBS recovery this month. I don’t think about GBS every minute anymore. I’m able to hang out with friends from time to time, without worrying I’m going be unable to function for the next two days. I can take my kids to the pool, and not feel like I’m going to keel over. My energy budget has grown. I just still have to remember to spend it wisely. Thanks, Jim! I don’t feel as young as I once did, but hopefully I can wind the clock backwards a bit over the next few months.